At the last WOMM Supergenius conference we went to Martin’s talk, and we walked away with a ton of ideas… check out his post below, and come see Martin and others at the WOMM CrashCourse Conference May 10th in Austin, TX! Martin Atkins is a rock star. Like, an actual rock star. He’s a drummer and has played for bands like Public Image Ltd., Ministry, and Nine Inch Nails. Today he still tours and performs on stage — but now he does it to teach new bands how to earn loyal fans. The bands he works with have no budgets, no extra resources, and face a crowded and noisy market. Sound familiar? 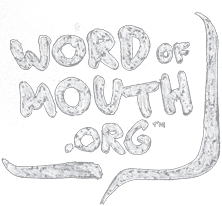 Martin spoke at our last word of mouth event, and as a preview for our Word of Mouth Crash Course in Austin on May 10, we wanted to share it with you. (If you love this presentation, register here to see more like it live and in person). Martin talks about how bands often start out by worrying about filling stadiums of 20,000 people — but that’s before they’ve taken the time to think about the first two fans on the couch who might actually love them. Martin says to start small, think small, and stay humble. Very, very few bands earn 20,000 fans at a time. Instead, focus on the first two and then repeat 9,999 more times. It’s hard work, but it’s worth it. If all else fails, DTO: Do The Opposite. During his presentation, Martin pulled out a giant old cell phone and told the story of how he once walked into a crowded room of celebrities and pulled it out. His point: You can’t win the new iPhone/Blackberry/Droid game. But you can do something unexpected, memorable, and remarkable by doing the opposite. Martin works with bands all the time and says that if given the choice, a band will always choose the 5,000 or 20,000-person venue over a small one. But that’s not creating the best experience. Instead, he urges them to choose the smaller venue — one they can sell out and leave people standing outside wanting in. Martin shared the story of how one band actually got a record deal by locking everyone out of the venue, which drove a bunch of interest in them. Rock superstars Radiohead got everyone talking when they released their album and told fans to “pay what you want.” A few years later, Panera did it with one of their branches in St. Louis. And again — people talked about how brilliant it was. You can do this too. Look for ideas that create excitement in other industries and markets and give them a try. If it fails to create word of mouth — no problem! That means nobody knows about it (and you can try again). People talk about the different, the unique, and the can’t-get-anywhere-else. Musicians are doing it by creating one-off merchandise at tents outside of concerts. They’re doing goofy things with their packaging (Martin once released an album that smelled like blueberry muffins). This works in business too: Your fans want to see your personality and your uniqueness. So, what can you make more personal today? Watch Martin’s video below (but a friendly warning: A lot of Martin’s great ideas are wrapped in NSFW language). And to see more incredible presentations like it live, check out the lineup for our upcoming Word of Mouth Crash Course conference. “You have ideas that the world needs to hear. But great ideas don’t always get the recognition they deserve. You need to help it along, and that takes word of mouth marketing. 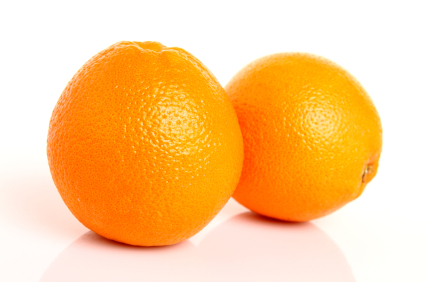 Learn how to do this at the Word of Mouth Crash Course on May 10 in Austin. This is the “How to be Great at Word of Mouth Marketing” conference. Our promise: You’ll use what you learn to get more business the very next day, without spending money. Get simple, hands-on advice from people who’ve really done it. This is a practical, you-can-do-it, blow-your-mind-with-results kind of day. You’re going to learn how love and happiness bring in more customers. And I guarantee you’ll feel lovelier and happier when you get more sales while spending much less on marketing. You’ll learn the 12 essential word of mouth skills to run an effective word of mouth marketing program. 12 fantastic brands will show you exactly how they do it, so you can bring in more customers too. Real advice based on real-world word of mouth success stories from Discovery Communications, Maker’s Mark, Noodles & Company, Threadless, WindsorONE, Don’t Mess With Texas, Headsets.com, Movember, Costco, Domino’s, Boeing, and P&G. Why is it a one-day conference? Because we’re going to blow your mind, man. Because you are going to be so energized, so empowered, so excited to do what you learn — that there’s no way you’ll be able to sit still for a second day. You will run out of this meeting and plan your first big word of mouth campaign. You’ll do it the next day. It’ll be simple, easy, and cheap. And you’ll get more customers. Immediately. And then you’ll do it again. A little bigger. And again. A lot bigger. And then you’ll be bringing in more customers, every day, because your fans will tell their friends how much they love you. But I’d rather spend all my money on expensive advertising! You go, girl. Advertising might work for you. Not us. Advertising is the price of being boring. You only have two ways to get your message out there: Love or money. You can buy advertising, you can pay people to talk for you. But you always pay, every time — forever. But when people talk for love instead of money, it’s sustainable and renewable and it grows with use instead of getting used up. Now is the time to build an army of fans who will talk about you because they love you. This isn’t Woodstock. We’re talking about selling stuff. Southwest Airlines has nearly 40 consecutive years of profits. In an industry where everyone else is struggling financially, facing disgruntled employees, and making customers angry, Southwest is thriving. In her keynote, Southwest’s President Emeritus, Colleen Barrett, will teach us how she inspired an entire company to earn the love and respect of their customers — and how it’s led to incredible success. Holy moly! Do I get to have lunch with an amazing author? Yes, you do. It’ll be a tough choice. This is not what you are expecting. No panels, no vendors, no blather, no selling. 30 speakers. 20 minutes each. TED-conference style. It’s fast, it’s fascinating, and new ideas come shooting at you like marshmallows from a marshmallow gun. Why TED-style? 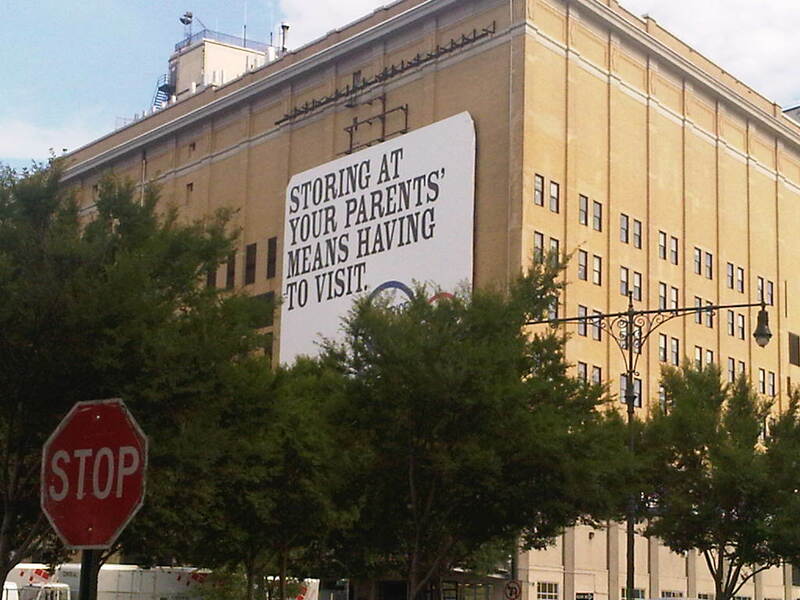 Because if it’s good enough for Billy Graham, Bill Gates, and Bill Clinton, it’s good enough for us marketing dudes. This is not a conference. You won’t find yourself locked in a dark hotel ballroom with scary carpet and bad light for three days. It’s one invigorating, intense day in a sunny room. 20-foot windows and blue skies. An environment to open your spirit and open your mind to ideas that will change how you do business forever. You’ll be refreshed, excited, and ready to do it. Is it really as good as you say? Word of mouth and social media leaders from 3M, Aflac, Allstate, American Express, American Family Insurance, Ariba, AT&T, Audi, Barnes & Noble, Best Buy, Boeing, Campbell Soup, Capital One, Charles Schwab, Chevron, Chick-fil-A, Cisco, Clorox, Coach, Coca-Cola, Coldwell Banker, Community Medical Centers, ConAgra Foods, Crate & Barrel, Dell, Discover, Dole, Domino’s, DuPont, eBay, FedEx, Ford, Gannett, Gap, GE, General Mills, General Motors, Google, Graco, Hertz, The Home Depot, HP, H&R Block, HSBC, Humana, IBM, IKEA, Intel, Intuit, Johnson & Johnson, Kaiser Permanente, Levi Strauss, Mattel, Mayo Clinic, McDonald’s, MetLife, Michelin, Microsoft, Molson, NHL, NBC Universal, Nestle Purina, Nokia, Northwestern Mutual, Novartis, Oracle, Orbitz, PayPal, PepsiCo, Petro-Canada, Pfizer, Procter & Gamble, Progressive Insurance, SAP, Sears, Serta, Sharpie, Sony, Sprint, Starbucks, State Farm, Sun Microsystems, SunGard, Symantec, Target, The North Face, Ticketmaster, TiVo, Turner Broadcasting System, Tyson Foods, United Airlines, UPS, USAA, U.S. Navy, Verizon, VIZIO, Walmart, Wells Fargo, and Whirlpool. But I still don’t believe you. It couldn’t be that good. The Word of Mouth Crash Course is so great we’re giving it all away — because we know you’ll just have to show up and see it live. But are the new speakers as good as last time? Even if you can’t make the event, you’ll learn a ton. Share the videos with your office and friends. Important note: Attendees of our conferences report whiter teeth, shinier hair, lose an average of 6 pounds, and earn the respect of their peers. Results may vary. 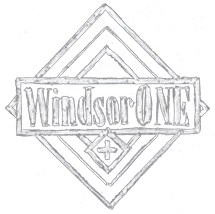 WINDSORONE-SENTME will get you a 25% discount! Oh, and the best part… WE’RE SPEAKING! Talk about some strong WOMM. Across the street from this “blogger’s” (lol) home, a builder, architect, and investor built a very nice spec home… which they recently finished and sold. Rest assured that I’ll be calling these guys when it’s time to remodel. 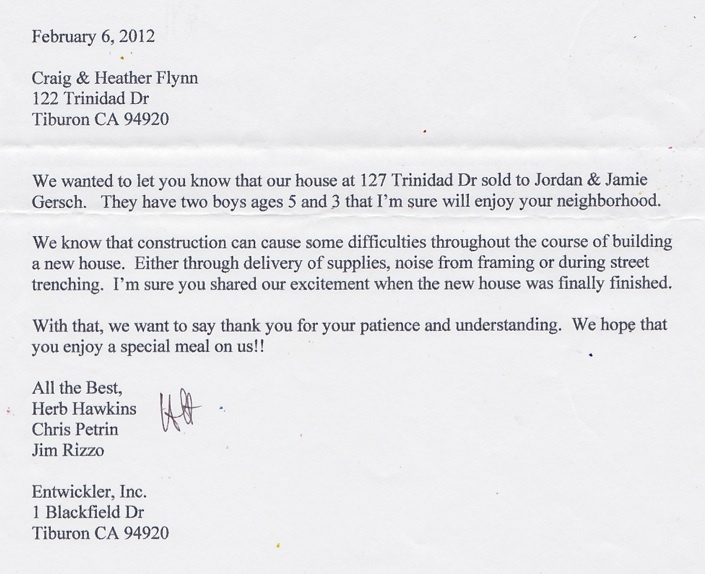 Herb Hawkins Construction & Rizzo Associates. More details to come as they’re announced… (oh, and stand by for a discount code if you’re gonna sign up!). What Isn’t Your Customer Telling You? An objection is really an opportunity. It gives you a chance to target the information you are missing. When your prospect raises an objection, listen for what she’s not telling you because that objection is merely a symptom of an underlying Basic Issue. That Basic Issue is something deeply personal that leads the prospect to believe she’ll be taking a risk and will be on the losing side if she agrees to your proposal. An objection such as: “We do not have time for this,” may actually be telling you that the customer feels overwhelmed given the current projects this quarter. Taking on more would make her appear incompetent, or that she will have to work longer hours thereby sacrificing time with family. You also hear the common objection, “Your price is outrageous!” A possible translation would be that this person has sponsored a similar project in the past that did not deliver as expected and she’s not confident that approving yours would improve her credibility to the board. The severity of the customer’s Basic Issue can go from bad to worse over time unless you consciously step in. Do so any time in the sales call where you sense your customer is in an “I’m losing” frame of mind. There are ways to discuss and work with those feelings but the one thing you should NOT do is to deny their validity. Saying something like, “You shouldn’t feel that way,” is a surefire way of killing your deal on the spot. No matter how you phrase the questions, the objective is to uncover the area of distress so you can address it. And because you’re dealing with feelings and attitudes, it’s especially important that you pause and listen to the answers. You want to convey to your prospect that you are a partner who is invested in her success as a result of this deal. Did you miss the previous issues? Get them here. Should be a best seller on Amazon. Sernovitz was kind enough to send me a discount code for 33% off, drop me an e-mail and I’ll send you da info.